A tortoiseshell box of circular form with slightly domed cover and straight sides. 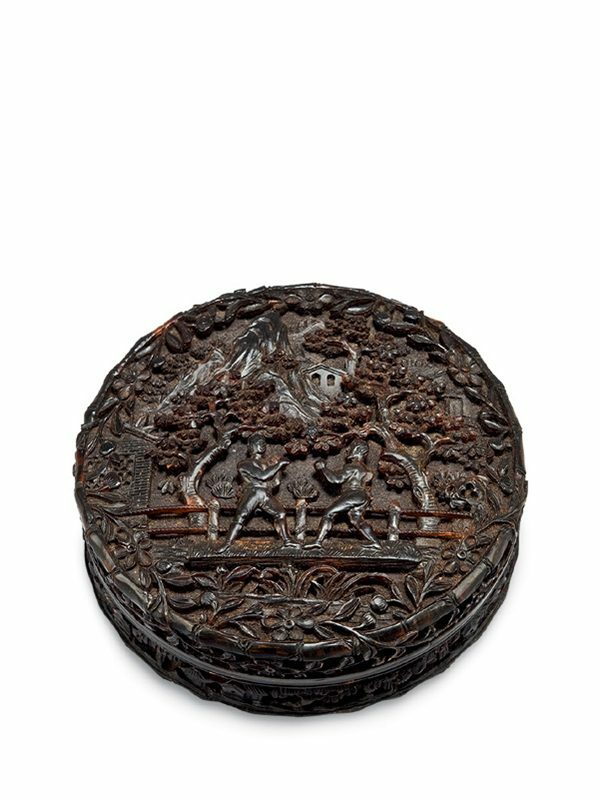 The domed cover is carved with an intricate and detailed scene of an open-air boxing match between two Western men. The platform upon which they stand is framed on either side by a pine and prunus tree and set against a Chinese landscape with rugged mountains with small pavilions on the top. The scene is bordered by a bamboo design and a repeat design of flowering branches, which extend up and over the bamboo border from the sides. The sides of the lid are decorated with a design of flowering branches while small pavilions amidst a wooded and mountainous terrain decorate the sides of the container. The base of the box is carved in shallow relief and shows four Chinese figures in a garden setting against landscape, with houses, trees and rocky outcrops. This intricately carved and very unusual tortoiseshell box is a perfect example of the combination of Chinese landscape and a western theme that was popular from the 18th century. Tortoiseshell carvings of objects including small boxes, combs and other personal items originating in China during the late 18th century in Guangzhou. Such boxes were aimed at the western market and were very popular in the Regency period in England in particular. Elaborately carved snuffboxes made from tortoiseshell showing an armorial shield or initials are much more commonly found. The depiction of western figures in a Chinese setting is extremely rare or even unique. Closely comparable depictions of boxing matches are seen in several coloured etchings, dated between the late 18th and early 19th century; some are in the collection of the Museum of London (fig. 1) and some in the Bridgeman Art Library . Looking at the depiction of the two bare-knuckle boxers and their dress style, typical of English boxing, this box could well be made for the English market. An example of the fairly commonly found tortoiseshell box depicting a view of Napoleon’s tomb on St. Helena is in the collection of the Hong Kong Museum of Art and is dated to circa 1830. Another comparable tortoiseshell box made about 1820 is in the Jenyns Collection at Bottisham Hall in Cambridgeshire.